Cardcaptor Sakura is a Japanese shōjo manga series written and illustrated by the manga group Clamp, originally serialized from May 1996 to June 2000. But you probably remember of the TV series adaptation produced by the animation studio Madhouse. The story focuses on Sakura Kinomoto, an elementary school student who discovers that she possesses magical powers after accidentally freeing a set of magical cards from the book they had been sealed in for years. ・Sakura, here adapted into a fantastic 1/7 scale statue looks better than ever ! ・The amazingly detailed sculpt brings Sakura to life with tons of details in her hair and her puffy ruffled skirt. ・This statue of Sakura is over 18 cm tall, flying among the clouds on her Sealing Wand. 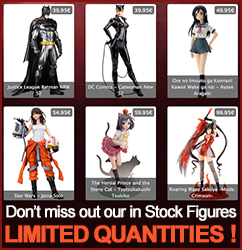 ・Display alone or alongside other anime statues from Kotobukiya.